Russ was in the Night Stalkers from 1984-1991, and served with “plank holders,” original members of the unit that involved in Honey Badger. He confirmed historical details that I’d collected in BBL articles on Honey Badger and TF 158 were accurate, but added depth and insight on their formation and method of operation. 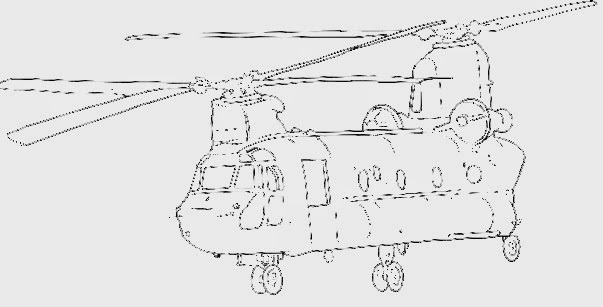 He discussed different CH-47 models, D, and MH-47-D, but I believe at least some of these variants came after the time period. 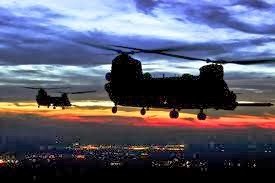 CH-47s were modified in Lexington, KY. Helicopters have a limited combat radius. (Roughly 100 miles). Rotor to rotor, the CH-47 is 101 feet long, a big fuel-hungry beast. CH-47s are very expensive to operate, burn a lot of fuel, about 200 gallons per hour. The CH-47’s role was largely to ferry fuel, setting up FARPs (forward arming and refueling point) for other helicopters such as Blackhawks Hueys and Little Birds. The goal was to get them in and out as quickly as possible. He mentioned it took 25 minutes to pump. FARP extends range, but also involves more equipment, manpower and pre-planning. At the time of the events, the CH-47 was a workhorse, and a chief use was to deliver fuel. It was a bit later that they refined and developed its offensive capabilities. What can 23 helicopters do that a few can’t? He was puzzled by the great number reported, and says it would have involved their entire inventory. CH-47s are fast and powerful. OH-6 Little Birds rarely fly together with them, and they’d be an unlikely match for the 2nd type reported. Doubts that Little Birds were involved, their primary role was to bring in snipers. Others were armed, but again seems unlikely for this role here. Also, the number of helicopters reported was difficult for him to accept. An operation of just 12 Chinooks at one time and place is a big operation. He also has concerns about how low and slow they were flying. Each aspect creates problems with fuel consumption and other things. At 25 ft, flight is assisted by lift from rotor wash (hovering in-ground-effect HIGE). 85 ft high hovering requires much more power. Typical speed would be 100 MPH. Flying slower as described in the case is more difficult. Russ thinks it is impossible that the helicopters could have avoided being detected on airport radar, or unseen by air traffic into it. Also, standard procedure is to clear flights with the local airport. It is possible, but unlikely they were low enough at all times to avoid radar detection. I asked him about noise and detection by locals besides the main witnesses. He felt much more should have been seen and heard. A CH-47 makes a low, deep and loud “buppata-buppata” sound, copters with tail rotors make more of a high-pitched buzz/whine. Noise from helicopters, especially that many would rattle windows. The sound of even a few helicopters should have been widely noticed throughout the area. He’s puzzled by why the concentration of helicopter witnesses are all east of Lake Houston. Strange, because the UFO and copters were last seen heading west. The sound carries and causes vibrations that you can feel in your body, particularly the air in your lungs. Also, a CH-47 flying at 80 or 90 feet would produce a tremendous amount of rotor wash and blow around anything on the ground, leaves etc. 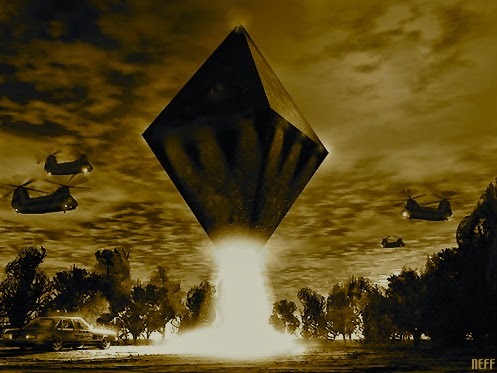 If the event happened as reported, he feels this must have been orchestrated, as the time involved to travel and catch the UFO from any base is prohibitive. Also,it seems unlikely the copters were there by chance, leaving a planned mission as the most plausible scenario. With the number involved, a support or recovery mission makes the most sense. The helicopters would have come in for a specific purpose. Mission protocol is typically is to get in and out. They don’t hold ground. Low Visibility- Russ was puzzled how the witnesses could see the copters and count them. Helicopters are intended to be difficult to see at night. They are painted a very dull, flat color, virtually black. CARC paint (Chemical Agent Resistant Coating), dull color, “US Army” logo painted in slightly different shade. (1980 copters may not have used CARC, but otherwise the description of dark, non-reflective paint is accurate.) If the scenario in case is true, they probably would not have been flying with their position lights on. He feels it is unlikely they could have been clearly visible. Searchlights- Chinooks are equipped with two rotating lights near the nose, one white and the other an invisible pink light for NVG. He feels that a search like L.L. Walker describes is unlikely, as they would be using the pink invisible lights, and flying in groups of three. Formation flying requires primary attention to be focused on the lead aircraft. I commented that the large number of men involved makes it difficult to understand that why pilots, command or support crew have not talked about the case. He agrees that is troubling, but does feel that military discipline and loyalty is generally effective in preventing leaks. He cited Aldrich Ames as an example of how leaks might be punished. The 160th was initially classified, centering on antiterrorist missions. In 1983, they had several bad crashes related to the testing of the night vision equipment. Some of these events became fuel for accusation and speculation. In the early 1980s, there was a great deal of speculation about the Night Stalkers and their activity, and accusations of conspiratorial activities like them faking crashes in order to provide cover stories for man killed in secret missions. When the 160th loosened up sharing details on their operations, the press lost interest once they were no longer secret. They were able to get back to business without the distractions. Every CH-47 is accounted for (They are precious and in demand.) Equipment secrets are rare, most secrets are about mission profiles. He noted that he held a top secret clearance while part of the unit, but that many things are compartmentalized and shared with only those with a need to know. similar techniques and methods are used by civilian contractors working of the military., they only see a small piece of the puzzle unless it is necessary. 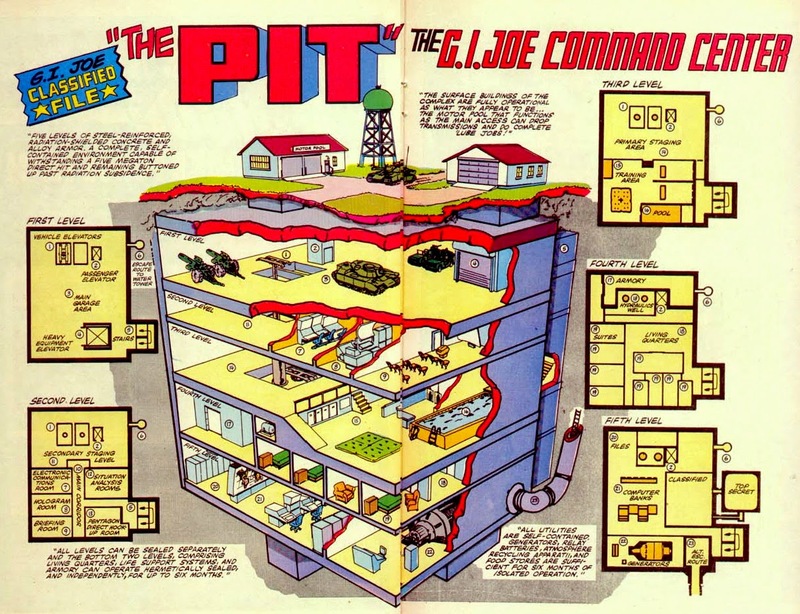 I asked Russ if we had secret underground bases full of armament like “the Pit” seen in G.I. Joe, but he said no. It was far more likely that equipment would be gathered from conventional bases and used on secret missions as needed. The military may have additional assets unknown to the public, but if so, it would have to be small in number. He thinks it is unlikely that there is unknown hardware in operation. Its more likely that if they wanted to camouflage their presence it might be done by flying commercial civilian vehicles. 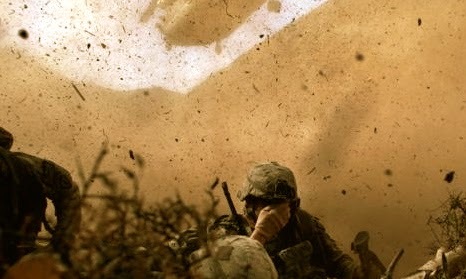 Russ said he’d never heard any UFO tales among the many war stories told of the unit. He does believe that the US is keeping some UFO secrets, and that there was a UFO crash at Roswell and possibly two other ones in the modern era. He seems to think UFOs are tied to the history of the planet, and that it might relate to our pre-history, ancient civilizations, things long forgotten. As previously mentioned, Russ says that military discipline and loyalty is generally effective in preventing leaks, but there are other methods used as well. Government tactics to prevent UFOs from being exposed and taken seriously, are ridicule, intimidation and threats. I asked him if he had thoughts on what the UFO could have been if it were a military craft. He didn’t have a particular match in mind but speculated that it could be something like an atomic rocket engine or unmanned vehicle test. He knew of no specific candidate projects or vehicles to explain the UFO. I’d asked Russ to check with his contacts and see if anyone remembered flying in right time and place to be seen by the Cash-Landrum witnesses. He doubts the military was involved in the Cash-Landrum case. Russ’ conclusion is that while the CH-47 matches the equipment used by his unit, the methods, techniques, behavior and reported details of the helicopters make it an unlikely match for an operation by Task Force 158. The number of helicopters involved is incredible. He is also at a loss to offer another plausible candidate. The one scenario he feels could explain their involvement is an incredible coincidence, them flying in the area as the UFO happened to be in distress. As I posted before, the idea that there were nearly two dozen helicopters present is not realistic. It's likely the witnesses double and triple-counted helicopters that were circling. Also, if we assume this craft's provenance was CIA or USAF, then it's not likely TF160 would have been involved unless they came upon the craft by chance or there was a serious emergency. The USAF in 1980 was rebuilding its special operations rotary wing assets but did have HH-53s in the CSAR role that could provide heavy lift. The CIA or a contractor like Lockheed could easily have purchased Boeing 234s, the civilian version of the CH-47. These might have been painted in quasi-military liveries. Also, it being dark and the object being blinding in appearance, we have to take any witness testimony of helicopter appearance with a grain of salt. So I think the TF160 or US Army rotary wing involvement in this sighting is a dead end.